Baggage fees are fast becoming an unavoidable part of U.S. flying - the largest two carriers now charge $15 for a first checked bag. United Airlines announced its new fee on Thursday, three weeks after American Airlines set the precedent for the charge. Most U.S. carriers already have instituted a $25 charge for checking a second bag - part of a potpourri of new fees that reflect a struggling airline industry passing along record fuel prices to passengers in the form of higher fares, fuel surcharges and service charges. As of July 1, Southwest Airlines will be the only U.S. carrier that permits two checked bags for free, according to air travel expert Tom Parsons, who expects still more service fees to come. 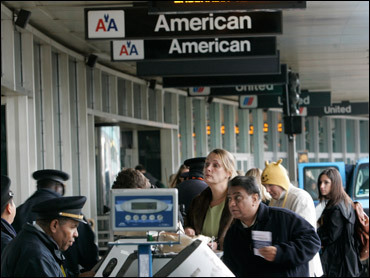 "The major airlines are truly a la carte now - you don't get anything free any more," said Parsons, chief executive of the travel Web site Bestfares.com. "You get a tin can in the air, and anything else you pay as you go." He expects the legacy carriers to follow the lead of discount carrier Spirit Airlines, which now charges extra for seat reservations - $5 for middle seats, $10 for window and aisle seats and $15 for exit-row seats. Other airlines also have begun charging for window or aisle seats. UAL Corp.'s United said its baggage fee goes into place with customers who buy tickets beginning Friday for domestic flights of Aug. 18 or later. It does not apply to customers flying in first or business class or those who have premier status with United or Star Alliance, and first and second bags will still be free for itineraries that include international flights, aside from Canada. The Chicago-based carrier also is increasing the fee to check three or more bags, overweight bags or items that require special handling to $125 from $100, or to $250 from $200, depending on the item. "With record-breaking fuel prices, we must pursue new revenue opportunities while continuing to offer competitive fares by tailoring our products and services around what our customers value most and are willing to pay for," said John Tague, United's chief operating officer. United estimates the potential revenue from baggage handling service fees at about $275 million a year. It expects the new $15 service fee to apply to one in every three customers. UAL shares rose 26 cents, or 3.6 percent, to $7.48 in afternoon trading as crude oil prices fell.